I’ve actually made this three times, though the first two times were just me experimenting (and eating the results of my experiments), refining it a bit each time. I based it on this recipe from Gen Foodie and this one from Tracey’s Culinary Adventures. Note that the ingredients here will give you a bit more than you need for 48 crab rangoons. The extra made a delicious dip! 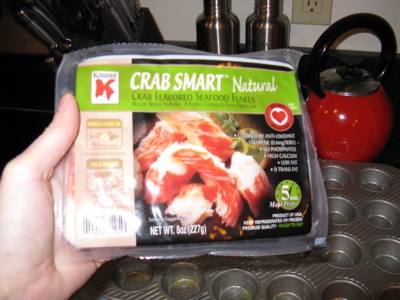 Make sure the crab meat is well broken up into small pieces. 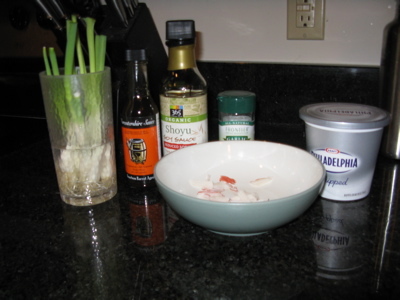 Combine with the cream cheese, Greek Yogurt, Worcestershire and soy sauce, garlic powder, and cooked scallions. This can be refrigerated. I’ve read online you can refrigerate it up to a day, though I think two might be ok. The most time-consuming part of this is actually filling the wraps. These can be frozen, or so the internet tells me, and you can also refrigerate them for a day or so. I refrigerated mine a few hours and that worked fine. 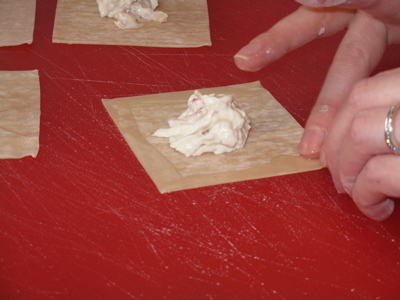 Dipping your fingertips in water, wet the edges of a wrap and fold in half, till two of the corners meet. Press along the edges to make them stick together. 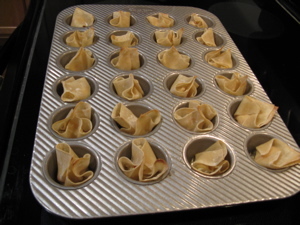 There are occasional spillage issues with this when you bake the crab rangoon. I’ve read getting all of the air out before you seal it helps prevent this. Repeat till you’re done with this batch! Move the batch to a container or to your baking sheets. 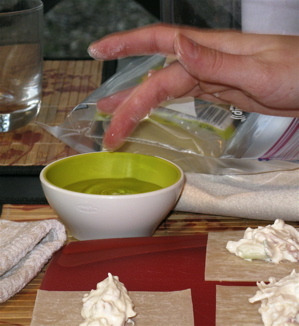 Make sure your work surface and fingers are clean and dry before you put down the next set of won tons. This is all much easier if you have a helper, as I did. Thanks, honey! For refrigerating, we separated the layers in the container with wax paper, though they really didn’t stick together very much anyway. Put in the oven for about 10 minutes. If you can, flip at about 5 minutes. 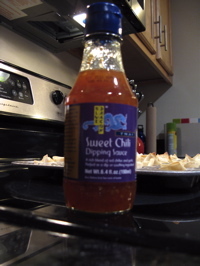 Serve with the chili sauce, and enjoy! They’re definitely best right out of the oven, though decent reheated the next day as well. I doubt they’ll last longer than a day or two though. 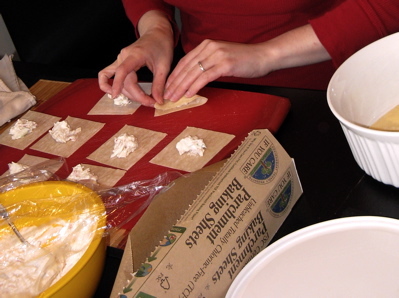 There’s an alternate method to the triangle crab rangoons. This method leads to less spillage, but I found I couldn’t put as much filling in each, and I kept ripping wrappers with this method. 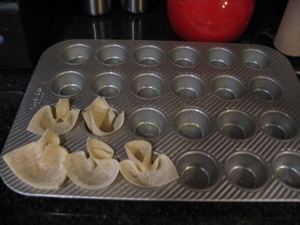 Basically, put the won ton wrappers in a mini muffin cups and fill (or fill and then put in the mini muffin cups). 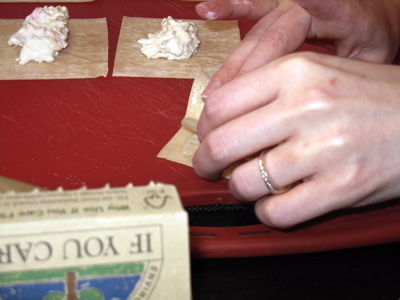 Wet the corners of each wrapper and bring them together to close each. Looks a bit more elegant, I’ll admit, and as I said you don’t end up with anything leaking out… but I go for taste over looks, as the blog name probably indicates. 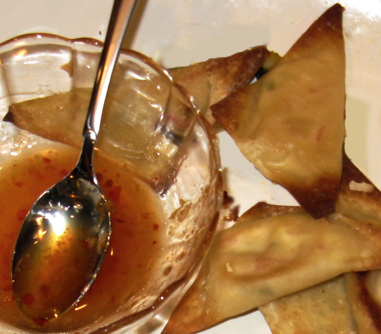 This entry was posted in Hors d'oeuvres, Recipe and tagged baked, crab rangoon, Worcestershire sauce.